Offer expires 4/30/2019 See dealer for details. Closed-end lease based on new 2020 Soul (Model #B2522) subject to credit approval, dealer participation, and vehicle availability. Offer shown based on $1,999 due at lease signing including $219 first monthly payment, $1,130 capitalized cost reduction, $650 acquisition fee, plus tax, title, license and registration fees, dealer conveyance fee, processing fee or optional service fee and any emission testing charge. No security deposit required.Lease Offer includes $500 Bonus Cash applied as a down payment. Offer shown total lease payments are $9,664. Actual payments may vary. Purchase option at lease-end for offer shown of residual value of $11,991.00. Lessee is responsible for insurance, maintenance, repairs, $.20 per mile over 12,000 miles/year, excess wear, and a $400 termination fee*. Lease offer applies to Soul (MSRP $19,985, includes freight, and excludes taxes, title, license, additional options and retailer charges). Actual prices set by dealer.Must take delivery from retail stock by 4/30/2019. Offer expires 4/30/2019 See dealer for details. Quantities limited. Available only at participating Kia dealers. Contact your local Kia dealer for availability. 0.9% Annual Percentage Rate (APR) up to 48 months. $21.22 per month per $1000 financed at 48 months. 1.9% Annual Percentage Rate (APR) up to 60 months. $17.48 per month per $1000 financed at 60 months. 2.9% Annual Percentage Rate (APR) up to 66 months. $16.41 per month per $1000 financed at 66 months. 3.9% Annual Percentage Rate (APR) up to 72 months. $15.60 per month per $1000 financed at 72 months. APR financing available, subject to credit approval by Kia Motors Finance (KMF), through KMF, to very well qualified buyers and not available on balloon financing. Only a limited number of customers will qualify for advertised APR. No down payment required. Must take delivery from a participating dealer and from retail stock from 4/2/2019 to 4/30/2019. Offer expires 4/30/2019 See dealer for details. Cash back from Kia Motors America, Inc (KMA).Must take delivery from a participating dealer and from retail stock from 4/2/2019 to 4/30/2019. 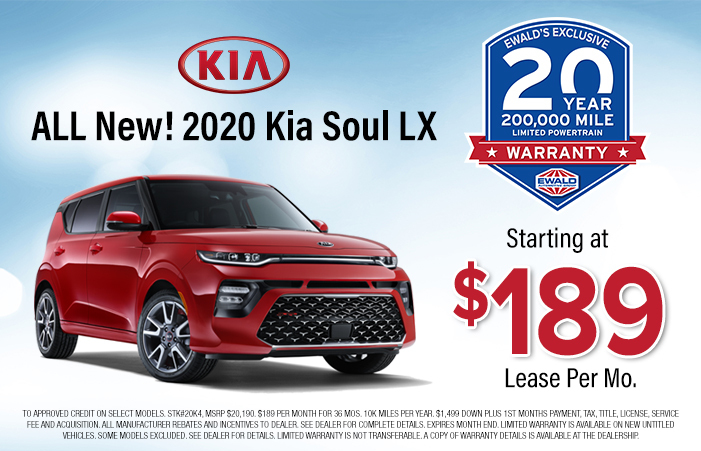 Cash back offer when you purchase a new 2020 Soul and may not be combined with finance or lease offers from Kia Motors Finance. This incentive is a limited time offer on eligible Kia vehicles. Not all incentive programs are compatible. See dealer for details. Has the time come where you want to get out of the vehicle you are currently driving? If you want to upgrade into something newer, Ewald’s Kia dealership near Milwaukee can easily help with that. Ewald Kia is well known around Wisconsin for our extensive selection of new Kia models for sale, Milwaukee lease deals, and much more. We are proud to offer many great Kia SUV models, Kia financing options, and Kia lease specials. All to help you fit the new Kia SUV for sale that you want into your budget. We make it easy to find and lease Kia SUV models when you come to Ewald Kia for your next new Kia SUV for sale. With our great selection and incredible prices on new Kia SUV models, you will be back to driving in no time. And in a Kia that you will surely love from your Ewald Kia dealership. Do you want to get yourself into one of the brand new Kia SUV models for sale, but are not sure you can swing the payment? Let us tell you about the many benefits of leasing. When you lease a vehicle, it can help you save some cash by offering a lower monthly payment option on the new Kia SUV model of your choice. Like the Kia Soul for sale. Getting the new Kia SUV model you love with the current Milwaukee lease deals and finance specials also helps keep down future expenses. That is because your new Kia SUV will be under the included manufacturers warranty for the majority, if not the full duration, of a lease. Stop in at Ewald Kia to find out the many other benefits when leasing your Kia Soul for sale. Ewald Milwaukee Kia wants to make sure that you find the new Kia SUV for sale and lease with a payment that is right for your needs. All by showing you all of the Kia finance specials and Milwaukee Kia lease deals available. Drivers such as yourself can get into a Kia Soul for sale they will love without breaking the bank thanks to the affordable Kia lease specials. Our range of new Kia SUV models and affordable Kia lease deals and finance offers are sure to get you back on the road in no time at all when you visit Ewald Kia! Many dream of getting into a vehicle that won’t break the bank. With the all-new 2020 Kia Soul lease offer, that dream can become a reality. The new Kia Soul lease offer provides drivers the comfort and style they crave with a payment they can afford. The new Kia Soul for sale and lease is a highly sought after Kia SUV model that can give you a driving experience that you will love. The Kia Soul for sale offers a spacious interior, an incredible fuel economy, and many high-tech features to spark your interest. Come to Ewald’s Kia dealership and check out a new Kia Soul for sale and lease today. Are you interested in the Kia Soul for sale and lease because of its many comfort and convenience features that come standard? You will not be disappointed when you check out the new Kia Soul for sale at Ewald Kia. You will find many standard features to enjoy while cruising the city streets in this model of new Kia SUV. Find amenities such as steering wheel controls for the audio, phone interface, and more on the fantastic new Kia Soul for sale. You will find many standard safety features on the Kia Soul too. Including electronic stability control, ABS and driveline traction control, and dual stage airbags. The Kia Soul is always an excellent choice when looking for an economical vehicle that is filled with comfort and convenience to make your drive more enjoyable. When you decide to check out new Kia SUV models, like the new Kia Soul for sale, you can be driving home in your new Kia SUV for sale in no time at all. Because of the many incredible Milwaukee lease deals and finance specials on Kia SUV models, you can enjoy a great time on the open roads of Wisconsin without hesitation. The many incredible features on the new Kia Soul for sale is undoubtedly enough reason to come and check one out today. Be sure to check out and take advantage of the online shopping tools while on our website. Check out the current Kia lease specials and offers if you are shopping for Ewald Kia SUV models online. Fill a secure an online credit application to get the ball rolling and be one step closer to driving home in your new Kia Soul for sale. For a closer look at a new 2020 Kia Soul for lease and sale, come to Ewald's Kia dealership today. You can reach Ewald Kia to schedule an appointment at (262) 226-2341.Or, to ask about the new Kia SUV models and Kia lease deals. If you’re in the area, come to Ewald Kia conveniently located at 36883 E. Wisconsin Avenue in Oconomowoc, WI 53066.